I personally reject any suggestion from anyone that the people of Virginia or our nation have retreated to the days of intolerance and discrimination of the past. Yet, I am not naive enough to believe that there are some elements of that still at hand. I know Louise Lucas and helped her win her first senate victory, here in the Commonwealth. I consider her a friend. I know, also, that this presidential campaign has been bitterly fought, in the republican nomination, and now during the general election. It portends to be one of the nastiest in our nation’s history. I first want to clarify the historical context of my election as Governor of the Commonwealth of Virginia. I was the first African-American elected by the popular vote of the people in any state in our nation’s history. P. B. S. Pinchback, the Lt. Governor of Louisiana, was selected by the legislature to fill the unexpired term of the Governor of that state, who had been impeached. He served for a little over a month. My election was the closest gubernatorial win in Virginia’s history. Other wins were closer in Lt. Governor’s races, and John Warner’s U. S. Senate win over Andrew Miller, (4,000 plus votes). I received significant cross-over support from Republicans which contributed to my victory. Even though I received overwhelming support from African Americans, there was defection among some white democrats, some of whom have subsequently confessed to me that they just could not bring themselves to pull the lever for me, yet admittedly regretted it. Many of them reflected that they wished that they had. 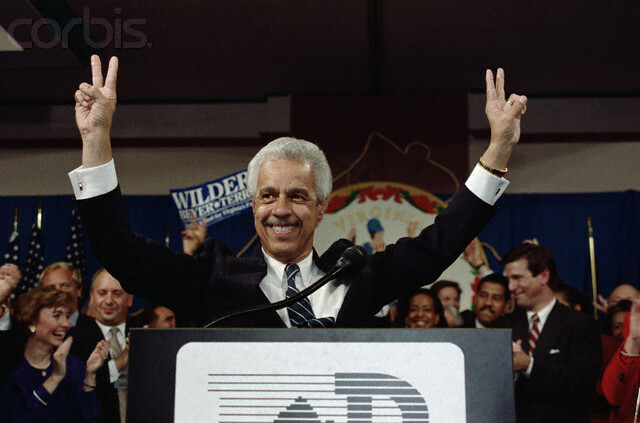 When I was elected Mayor of the City of Richmond, the first at-large election rather than being selected by the City Council, I received nearly 80% of the vote carrying every precinct and every district. That election afforded me the opportunity of becoming the first African-American elected to that office by the people in our city’s history. I speak just as a voter and have not spoken with anyone representing the president. I do not believe that it is in President Obama’s best interest to have the message conveyed that those who choose to vote against him are motivated solely by race. He should still be aware that Virginia is a state that he won in ’08 with 53% of the vote.